Love Haunt Powder-Stay On Someone's Mind, Permanently! 4 Ounce Love Haunt Body Butter-Stay On Their Mind! Love Haunt Candle-Stay On Your Lover's Mind, Permanently! Love Haunt Working-Stay On Someone's Mind, Permanently! Love Haunt Soap-Stay On Someone's Mind, Permanently! 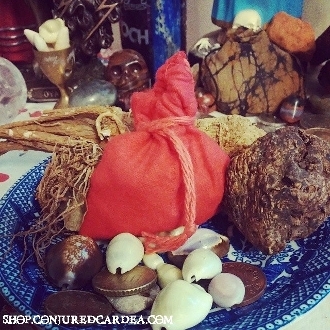 This root is known to conjure powerful magick and spirits. It will enhance any magick it is used with or any mojo it is added to. It is one of the most powerful roots I know of. It is sacred to Venus. Used medically as a nerve-calming tea, its magical reputation is highly protective, and it is used to force love. It is burned in black arts incense for hexing, but used as uncrossing incense with a yellow candle, it will destroy jinxes. This mojo contains cherry bark, rose petals, and dirt from the graves of a couple, it is said to "force" love.